Produce Level III, IV programs and COD, COE’s. Improve student performance in board exams and job placement. Improve IT and communication skills. Develop administrative, management, and leadership skills. Develop work-related productivity skills (competence). Form persons imbued with Christian values and conscience. Cultivate and deepen commitment to serve God and others. Peace – Peace remains a desired state in the island of Mindanao. 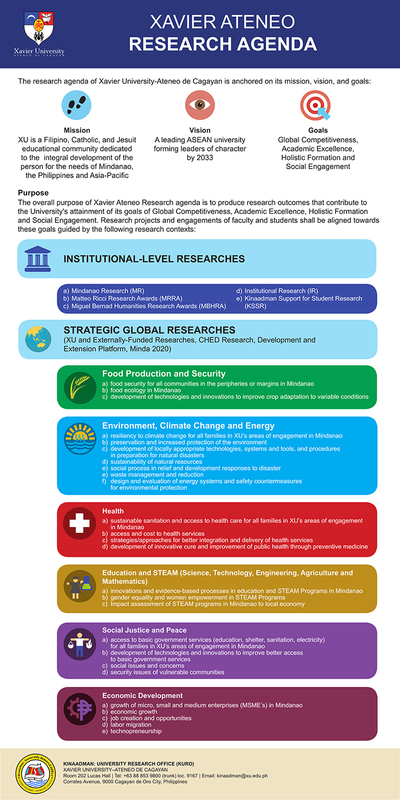 With the challenges to peace in many fronts, XU will facilitate the cultivation of a culture of peace by strengthening peace-building initiatives, primarily by developing the University as a hub and common ground for dialogue and resolution/transformation of conflicts, and development of peace champions within and outside the university. Upgrade physical and information infrastructure. Develop new campuses and other landholdings. Review and implementation of conflicting laws with special attention to land laws and IPRA.